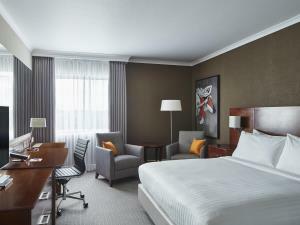 Leicester Marriott Hotel HotelThe newly refurbished Leicester Marriott Hotel is ideally located just minutes from junction 21 of the M1, yet set in a quiet area, perfect for exploring Leicester and the surrounding area. 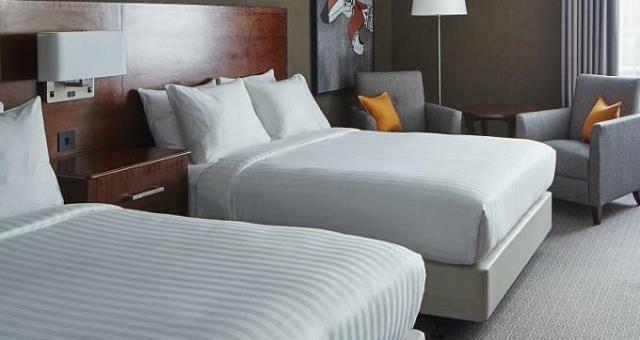 The hotel features modern, spacious air-conditioned rooms with soft, luxurious bedding, flat-screen TV, in-room safe with Wi-Fi internet available. For families the Leicester Marriott Hotel offers rooms with 2 double beds (subject to availability). For older children, a second interconnecting room may be purchased at a discounted rate (subject to availability). Please contact the hotel directly if you want to purchase this option using the contact telephone number below. After a day of sightseeing, relax or invigorate in the onsite gym, heated swimming pool, steam room and sauna. Our Market Kitchen menu is packed full of wholesome and culturally inspired dishes from around the world. Enjoy a range of superfood salads, pasta dishes, gourmet burgers, artisan meats and melt-in-your-mouth desserts. Light snacks, Paddy & Scott's coffees and teas are available in the bar. For enquiries please call 0116 282 0100. The newly refurbished Leicester Marriott Hotel is ideally located just minutes from junction 21 of the M1, yet set in a quiet area, perfect for exploring Leicester and the surrounding area. Only guide dogs accepted Children welcome from any age. Leave the M1 at junction 21 and follow directions for Leicester. Take the slip road for A563 signposted Leicester and Space Centre. At roundabout take the first left and head east on the A563 marked Leicester. Get into right outside land and at 2nd slip road turn right, signposted Business Park. At roundabout (approx 50 yards) take the last exit and the hotel is situated a the bottom of this road.